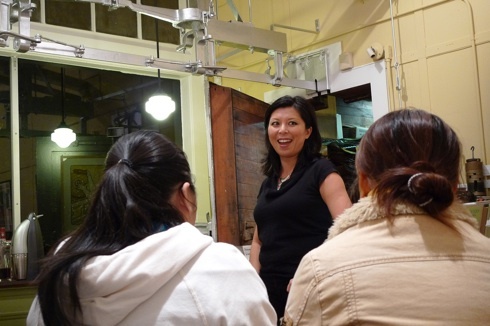 Jaden Hair, the most fabulous lady responsible for the Steamy Kitchen website, visited San Francisco this weekend for her very own book signing with us at Omnivore Books! I’ve been reading Jaden’s blog for several years now, and she is certainly one of the best out there. So, when word was out that she was finally coming out with a cookbook – I was psyched. Let me just say, her book is AWESOME – this shrimp is only one of the reasons! 1. It’s pretty! And she took all the photos *herself*. This is phenomenal for any cookbook author to be given such control over the layout of the cookbook. Inspiration for any budding food blogger, or really, just perfect for anyone who wants to be instantly hungry. 2. It features tasty and delicious Asian recipes, easy enough that anyone can make, even if you live hundreds of miles away from an Asian grocery and can only shop at a big-box . 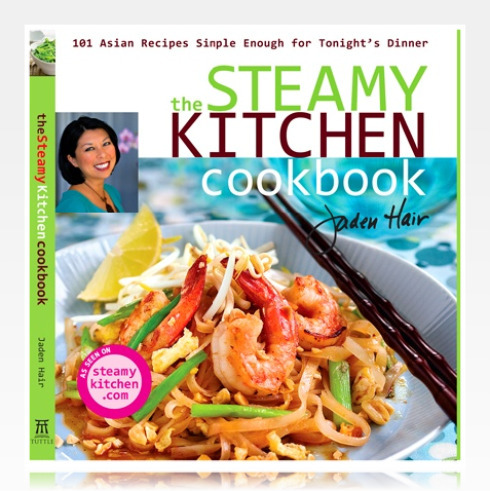 And, it’s really well organized – entertaining introduction, informative tools and a really great ingredient section where she goes into some depth about creating an asian-food friendly pantry – and helpful substitutions. 3. My copy is signed… in Pink Sharpie! Let me tell you, Jaden is as wonderful in real life as she comes across on her blog and in her cookbook. What a treat! Jaden’s coconut shrimp is delicious. 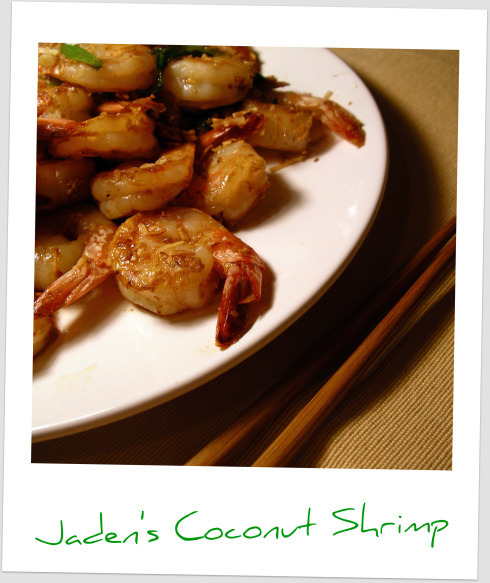 Shrimp, coconut, a little bit of booze – some of my favorite ingredients, period. Tonight I went into the liquor store and purchased a mini bottle of cognac to use in a recipe, and after making it, let me tell you – I sure as heck wish I had bought the whole bottle so that I can make this one on a regular basis and not have to go back! 1. In a wok or frying pan over medium eat, add the coconut and toast until golden brown. This should only take about 3 to 4 minutes. Take care not to burn the coconut! Once the coconut is toasted, immediately remove to a plate to cool. 2. Wipe the wok or pan dry and set over high heat. When a bead of water instantly sizzles and evaporates upon contact, add the oil and swirl to coat. Add the shrimp to the wok, keeping them in a single layer. Fry for 1 minute, flip and fry an additional minute until almost cooked through. Remove from the wok, keeping as much oil in the wok as possible. 3. Turn the heat to medium, add the butter and , once the butter starts bubbling, add the green onion and garlic. Fry until fragrant, about 30 seconds. Pour in the cognac and add the salt and sugar. Stir and return the shrimp to the wok. Let the whole thing bubble and thicken just a bit – the sauce should lightly coat the shrimp. Remove from the heat, sprinkle in the toasted coconut and toss well. Wise Note to Self / everyone: I served this on brown rice – which was tasty – but for next time I will split the sauce equally and not hoard it all on my own plate. But it was oh-so-delicious!!! The shrimp looks great! I need to a copy of Jaden’s book. It’s so great! I can’t fully express my love for it! I think I’m cooking out of it again tonight. .-= Kitchen M´s last blog ..Japanese Inspired Whole Wheat Udon Noodles =-. @Kitchen M – I was so pleasantly surprised that some of my favorite food bloggers including Jaden and Elise of Simply Recipes were such nice humble people! Ok! So I just made this for dinner and it was absolutely delicious! Yum and double yum! It is definitely on the repertoire from now on!